Sometimes, PublishPress users report that they are not receiving email notifications. If you’re having a problem with notifications, we recommend that you install the Email Log plugin. This plugin will keep a record of all the emails sent from your WordPress site, including any from PublishPress. If Revisionary emails are being recorded in Email Log, then you have an email delivery problem. Check your spam filters or email firewalls. Go to PublishPress > Settings. Scroll down to the “Featured” area. 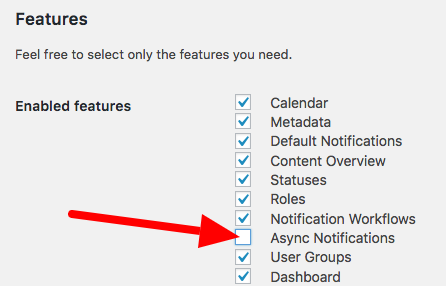 Uncheck the box for “ASync Notifications”. ASync is a useful feature that can improve your notification sending, particularly for scheduled content and for busy sites. However, it can cause problems on some sites and it is safe to disable this feature.